It was a good week backwater fishing Fernandina Beach. We were able to fish the jetties and the backwaters. Several great fish were caught using a variety of rigs and baits. The jetties produced some outstanding catches of redfish up to 30 inches. 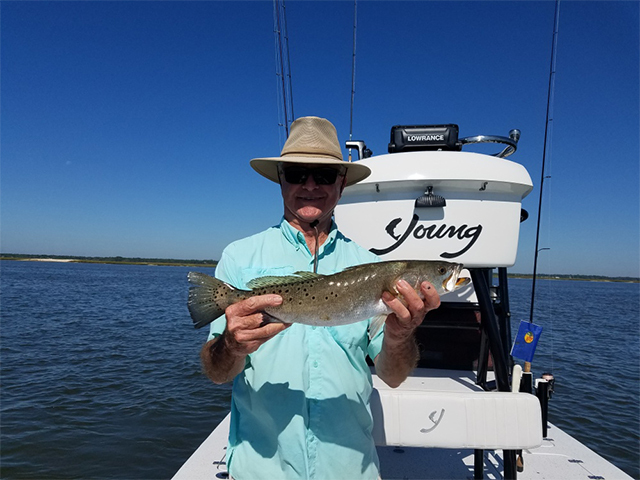 The speckled trout also got in on the action. The trout averaged 17 inches. The sharks were active too. A wide range of species consisting of a nurse shark, spinner shark, black tips and bonnetheads, Atlantic sharks. There were some bull whiting that were caught. The rig of choice was a 7/0 circle hook with a sinker slid and a fresh pogie for bait. The backwaters were awesome this week with lots of speckled trout, puppy drum, redfish, mangrove snapper and a few sharks being caught. The trout bite had produced some massive trout with several over the 22-inch mark. Had a few that were over 25 inches. The rig was a slip cork and a live shrimp fished from 2 feet up to 6 feet. The redfish were good slot size fish. They averaged 22 to 25 inches. The rig was also the slip cork and a live shrimp and we also used a ¼ ounce jighead with a piece of cut mullet. 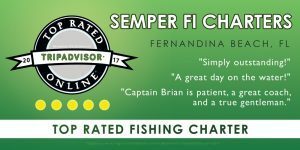 It was a fun week backwater fishing Fernandina Beach for all my clients. Quite a few of the catches were cleaned and taken over to the Salty Pelican for a tasty meal.